If you are looking for a way to decorate your wall without adding actual art, you may want to consider adding a bit of architecture. This lovely mirror takes on the look and feel of an elegant arched window, right down to the different panes. 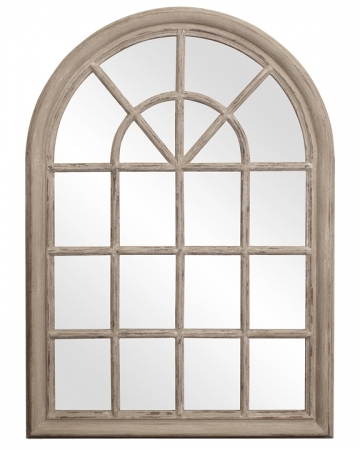 The mirror is framed in wood that is finished in rustic distressed taupe. 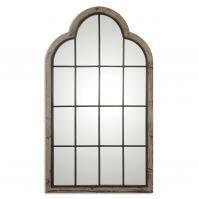 This would be a perfect match for upscale antique, shabby chic, or contemporary country dÈcor. 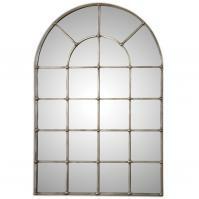 The mirror measures 29 inches by 41 inches and weighs 31 pounds. Brackets are included for mounting, and you might consider this piece for your living room or bedroom space. You've made me very happy! I love the product, loved the communication, the delivery was timely, the packaging great, and the thank you gifts are REALLY appreciated. I would definitely order from you again. GREAT customer service. Very pleased with everything, I would be pleased to recommend you anyone.